There was fire in the air of Philadelphia and it was not due to the holiday fireworks of the 4th of July (America's Independence Day). Approximately 1300 players trekked to Philly for the largest prize fund offered in the tournament's history. The World Open has traditionally been a place to catch up with old friends and renew acquaintances. Players of the African Diaspora came in full force and represented well in practically all sections. There were the stories of old veterans making big and also of new stars on the horizon. In the Open section, the big news was Emory Tate's 3rd IM norm and thus the title. For decades, Tate has been an influential fixture on the chess circuit and never fails to produce exciting chess. His result perhaps makes official what many of his fans and fellow competitors have already known… that Tate is at least IM strength. Discussion swirls about his misleading FM title, but his fame proceeds him as many of his spectacular games are well-known. In the 5th round of this tournament, he tested French GM Laurent Fressinet in a complicated struggled and proceeded to grind him down in a tense rook and pawn ending. However, Tate ended his tournament in thrilling fashion with a victory over Columbian GM Alonso Zapata. Emory Tate earned his 3rd IM norm at the 2006 World Open. Photo by Daaim Shabazz. 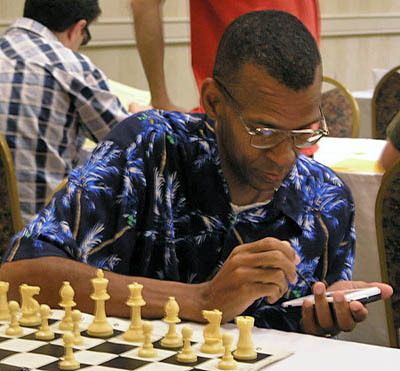 IM-elect Stephen Muhammad had his traditional good result at the World Open and joked about going for yet another IM norm. Muhammad has several norms, but needs the requisite 2400 rating to be conferred and this tournament may have given him a handful of points toward that goal. Amidst a field of 40+ Grandmaster, Muhammad appears to relish in the challenge every year. After holding GM Evgeny Najer, he stumbled against GM Jiri Stocek of the Czech Republic in what appeared to be a playable position. He expressed some disappointment about that game, but rebounded and closed with 6-3 and yes… another IM norm. Muhammad seemed to like using the Monroi handheld device which have become the rave in the chess world. There were some glitches during the World Open, but the devices provide real-time access to game scores with out the traditional recording problems (see games on the Monroi website). 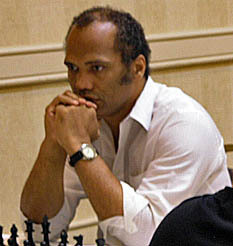 FM Farai Mandizha of Zimbabwe caused a stir at the Foxwoods Open in March by crushing Hikaru Nakamura in the 1st round. The young star earned an IM norm at that tournament and came to Philadelphia with similar ideas, but had a rough start with only ½-2½. After that he won four in a row and then earned a draw with GM Nick DeFirmian and beat IM Michael Mulyar. This was good enough for a 6-3 score and a share of 2300-2499 prize with Tate, Muhammad and several others. IM Amon Simutowe of Zambia stumbled a couple of times including what he claimed was a theoretcial draw against GM Zviad Izoria. The "Zambezi Shark" had trouble putting away weaker opposition, but after a six-month layoff he hopes to work his way back into form. He will close out his stellar undergraduate career in December and will decide on how to earn his final GM norm. Other performances by players of African descent were: FM Norman Rogers (5-4), Chikwere Onyekwere (5-4), IM Oladapo Adu (4-4), Lawyer Times (4-5) and Ernest "Steve" Colding (3½-5½). 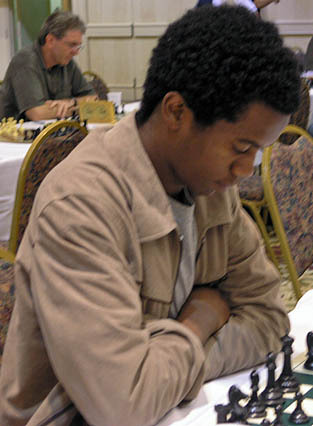 Farai Mandizha of Zimbabwe scored a solid result including a draw with GM Nick DeFirmian. Photo by Daaim Shabazz. In the under-2200 section, Okechukwu Iwu lead the charge by tallying 7-2 and tying for joint 3rd. R.O. Mitchell has recently come back on the chess scene after a long hiatus. He will forever be etched in history as 1990 US Junior Open champion. His 6½-2½ was part of a massive 10-way tie and it appears as if he will vault back over 2200. David Allen, Sr. matched Mitchell's 6½-2½ after overcoming a 1st round loss. A slew of players got 5½-3½… David Paulina, Glenn Bady, Ervin "Maliq" Matthew and Daaim Shabazz. Breaking even was Bill Turner with 4½-4½ along with scholastic star Jacob Wamala and Sylvester Smarty. In the under-2000 section, Jonathan Corrblah was able to translate his legendary blitz skills into a 7-2 result. His only loss was against one of the co-winners. The Midwest region came to play as Rev. Michael Gant (Cleveland, OH) and Samuel Ford (Chicago, IL) scored 6-3. 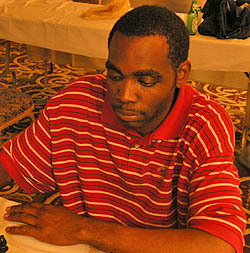 Scholastic standout James "Jimmy" Canty (Detroit, MI) scored 5½-3½ and made his presence felt between rounds by taking on several strong masters in blitz battles. His speed, sound play and tactical ability demonstrates that a bright future is in store. Clotaire Colas (uncle of 7-year old Joshua Colas) also scored 5½-3½. Walt Thompson (Indianapolis, IN) scored 5-4 and Ty Lee (Chicago, IL) broke even on 4½-4½. Travis Hoskins, formerly of Howard University and now in grad school at Georgia Tech got 4-5. Philadelphia native Pete Moss was also on 4-5. The under-1800 section, feature perhaps the best score by a player of African descent. Michael Williams (right) is a perennial World Open participant and this year scored a sparkling 8-1 for joint 1st and a $13,000 paycheck. Williams immediately vaults 100 points by going from 1779 to 1898. The avid Chess Drum supporter has been one of the most dedicated players in the Black community in Philadelphia and is deserving of his success. Darrian Robinson of Brooklyn, New York participated in the under-1800 section and scored a respectable 5-4 result. The 11-year old Robinson is one of two Black females scheduled to represent the USA at the World Youth Chess tournament in Batumi, Republic of Georgia. She and Medina Parrilla of the Bronx will travel provided they can find the funds for expenses. Chess-in-Schools is unable to provide any funding at this time. Coach Yury Lapshun is attempting to locate sponsors to send both girls to the tournament. Michael Williams scored 8-1 in the under-1800 section. The Philly native and top Drum supporter gained over 100 rating points in the tournament. Photo by Daaim Shabazz. Chima Umeakunne was joint 2nd in the under-1600 section with 7½-1½ while Odundo Akollo had 6-3. Reece Brown IV scored 6½-2½ in the under-1400 section. Hie effort comes after last year's 7-2 score in the under-1200 section. In the under-1200 section is another star in the making… Joshua Colas of White Plains, New York scored 4-5 and that effort may not seem very impressive until you learn that he is only seven years old! When seen playing blitz with father Guy Colas and it was apparent that young Joshua has the tactical eye for chess. While analyzing games with the Chess Drum's Daaim Shabazz, he was able to see rich tactical ideas and appeared to be totally engaged in the possiblities. When he was told about the "Friendship Match" that took place, he immediately wanted to play Trinidadian Ronnie Nelson, Jr. in a match. Keep an eye out for this talent! 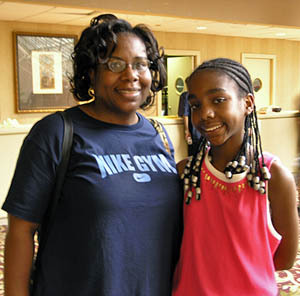 Cenceria Edwards and Darrian Robinson at the 2006 World Open. Darrian is a top under-13 player and earned the right to represent the USA at the World Youth tournament in Batumi, Republic of Georgia. Photo by Daaim Shabazz.